PennsylvAsia: Seoul Olympics in Pittsburgh. 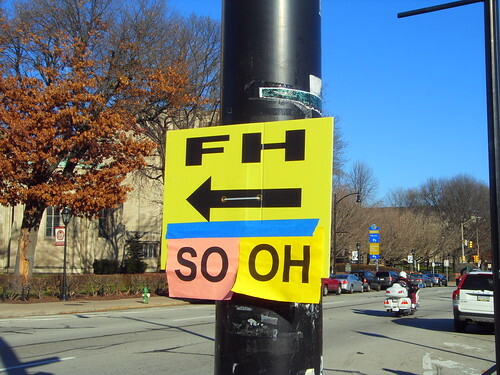 Sign pointing to the Foxcatcher set, Forbes Ave. and Bigelow Blvd. The working title used to be The Fair Hill Project. 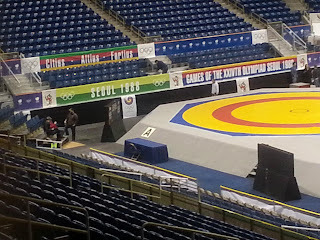 The movie Foxcatcher has been filming in Western Pennsylvania for a little while, and today it was in Oakland, at the Petersen Events Center on the University of Pittsburgh campus. They were looking for extras today for scenes, if Facebook was to be believed, depicting the 1988 Summer Olympics held in Seoul. We are looking for people to work as film extras on Thursday, DECEMBER 13. At the Petersen event center to recreate an olympic wrestling event at the Seoul Olympics. We are looking for people of multiple ethnicities who are able to work a full day (12 hours or more). Would probably start around 10am or 11am and go to 10pm or 11pm that evening. The movie tells the story of former Olympic wrestler Dave Schultz and the man who killed him. Schultz was a 1984 Olympian and coached in Seoul. I went to the Petersen Events Center today to have a look inside the new Sangmu Gymnasium, but of course it was closed off. One visitor took a few grainy pics, though, and posted them to her Twitter here and here. Youtube has some wrestling clips from 1988 if you'd like to see the real thing.